Before we get into this blog, please note, Kuehnert Appraisal & Consulting is not a law firm or a tax consultancy. You should always consult with your estate attorney or tax professional for your specific tax or estate questions or situations. The preceding disclaimer stated, I will discuss the process of having charitable donations evaluated by a professional property appraiser. I will also cover many of the questions that I have been asked throughout my career as an estate and fine property appraiser regarding charitable contributions. The donations considered in this article will be physical real property, not cash, stocks, intellectual property or other monetary instruments. It’s the end of the year and while the holidays are here and it may be the time when you being thinking of charitable donations. When donating items to charity, it is a must to consult with a personal property appraiser to ensure that your donations are appraised properly and “qualified” according to IRS regulations. 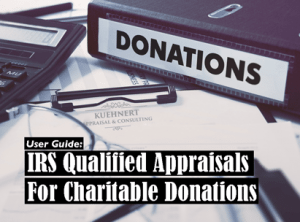 When Does My Charitable Donation Need A “Qualified” Appraisal by A Professional Appraiser? In general, any donor that wants to claim a charitable deduction of $5,000 or more is required by the IRS to obtain a qualified appraisal of the item’s monetary value. Moreover, the IRS requires that the appraised value is at the current Fair Market Value (FMV). Simply put and per the IRS, FMV is the price that property would sell for on the open market. Just because an item has significant sentimental value or future potential value does not mean it has current FMV. And that is the standard that the IRS requires the items to be appraised. What Does “Qualified” Appraisal Mean? As stated earlier, an appraisal must be “qualified” to satisfy the IRS. To the IRS a “qualified” appraisal is one not made earlier than 60 days before the property is donated and is received by the donor before the due date. One last point to remember; the donor, not the recipient must pay for the appraisal. What is A Qualified Appraiser? The IRS requires that any appraisal must be completed by a “qualified appraiser.” So what does that mean? It is important to have a team that can help you navigate the tax code when estate planning and when making a large charitable contribution. Having strong legal and tax advice is vital to ensure compliance with the tax code. It is also important to carefully select a professional and “qualified,” per the IRS definition, property appraiser for your charitable contribution of more than $5,000. In recent years the IRS has been paying extra scrutiny to the reliability and valuations given by appraisers for large property donations. Using a respected, experienced, and “qualified” appraiser can reduce red-tape, audits for donation value and validity, and make your donations go smoothly to organizations you want to help. With decades of experience in appraising fine art, collectibles and other property for charitable donations, Kuehnert Appraisal & Consulting is ready to work closely with your estate or tax planning team to ensure your donations are accurately valued and accepted by the IRS.